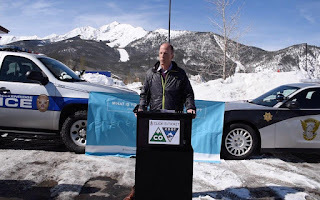 On Tuesday, March 26, 2019, the Colorado Department of Transportation (CDOT), St, Anthony Summit Medical Center, Summit County Public Health, and the Colorado State Patrol (CSP) came together to raise awareness about seat belt safety and promote the current Click It or Ticket enforcement period in Summit County. Representatives from the Red, White and Blue Fire Department, the Breckenridge Police Department and other Summit County Public Health agencies were also in attendance to support the effort and encourage people to buckle up. Sam Cole, Traffic Safety Communications Manager at CDOT. The event supported a six-day Click It or Ticket seat belt enforcement period, during which CDOT, CSP and local law enforcement agencies are focusing on rural areas of the state. Colorado’s seat belt use rate is 86 percent, which is well below the national average of 90 percent. Last year, 215 unbuckled drivers and passengers were killed in crashes in Colorado, accounting for more than half of the 410 total passenger vehicle deaths. In 2017, an estimated 70 lives could have been saved if everyone in Colorado had buckled up. 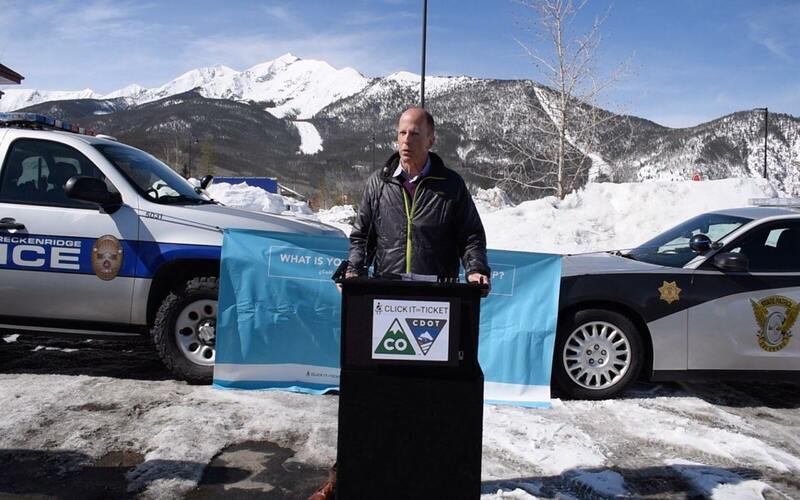 Summit County is being highlighted for its success around promoting and increasing seat belt use in the state. In 2018, Summit County’s seat belt use rate increased to 87 percent — a 3 percent increase from the previous year. The county now ranks in the top third in the state for seat belt use, but still below the national average. The March rural enforcement is the first of three Click It or Ticket enforcement periods in 2019. During the same Click It or Ticket enforcement last year, 1,279 seat belt citations were issued in rural communities across Colorado. Fines for not buckling up in Colorado start at $65, and parents or caregivers caught with an improperly restrained child can receive a minimum fine of $82. What can your county do to increase seat belt use and encourage people to buckle up? Click here for more information about seat belt safety and enforcement citation numbers in Colorado.